Yesterday I worked at the the yarn shop, and I took my bow sweater to work on it there. Since I’m back in again today, I left the project there overnight. So when I came home, I just had to cast on for a new sweater! Okay, yes, that’s a swatch, not a sweater. But it’s where it all starts! This is on 5mm needles, in Dream in Color Classy. I think the idea for this sweater is coming along in my mind, but it still has a ways (and a bunch of math) to go. This looks beautiful! 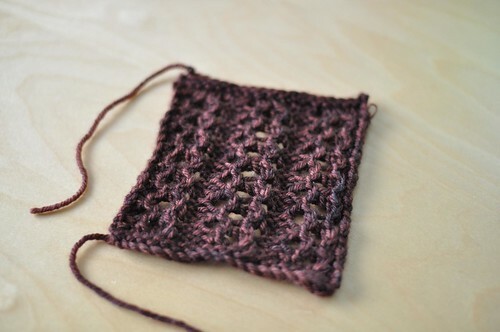 I love the color & stitch pattern. You didn’t drop it. You were blocking it. Yeah! I was thinking as Jen was above you were blocking it. You meant to do that. Wow, what a lovely swatch ! What’s the color ? Gothic rose, right? It seems it will become a wondrous garment !